If you’re looking for gold, there are two options for you. One, you can find the nearest Gold To Go machine and make your purchase. If you’re looking to do it yourself, you’ll need to buy a shovel and a sifting pan and hope you get lucky. 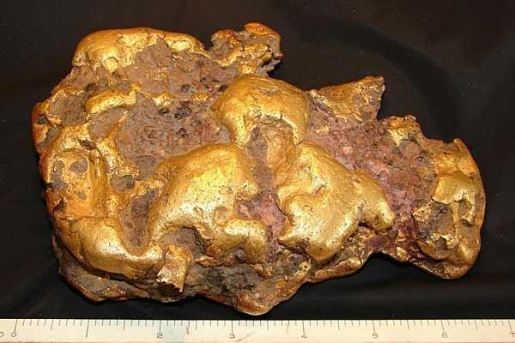 One unnamed prospector is very lucky following his discovery of a gigantic gold nugget. Dubbed The Washington Nugget, it’s a 6-pound 4-ounce nugget that is the largest California gold nugget ever uncovered, which is why it is expected to sell for over $400,000. It’s not every day that the largest gold nugget in California history gets put up for auction. The nugget was brought into the Reno, Nevada, office of Fred Holabird, a gold surveyor. The nugget was uncovered by a California prospector in the city of Washington, California, following a storm. The gold has a value of $135,000 at current record gold prices, but the nugget has a higher value thanks to its rarity.